Many online courses are presented in the form of videos. I usually play the videos at 1.5X speed, pausing when necessary to catch up when I am writing furiously. I rarely re-read my notes afterwards. This strategy works fine in courses that require superficial understanding, but for more in-depth learning, another level of effort is needed. I’ve known for a while that although I have completed nearly 100 online courses, I do struggle when I have to think hard and remember difficult material. Because I am planning to take some challenging courses in the next few months, I decided to brush up on my note-taking skills. Taking notes can help us pick out and remember the important points of a topic. If you are unsure what is most important, on the first run through the video or reading, think about what is being emphasised. What do the introductory and summing-up sentences say? Often there is a summary of the important points at the start or end (sometimes both), which can make your task easier. Taking notes can help students fully understand the material and explain it clearly. In a little book titled Take Notes, Ron Fry tells us to listen and concentrate. Keep your mind on the instructor’s words, not the view out the window or tonight’s dinner. Handwrite your notes. Although it might appear more efficient to type notes as the lecturer speaks, the faster typing speed often allows students to just copy the lecturer’s words, without having to analyse what is being said. This has been shown to be less effective for learning than having to think as you paraphrase and write the notes down. Perhaps this is also partly because more muscles and concentration are needed to physically write the words. Develop your own abbreviations for commonly used words, which may be different in different courses. Write down your own glossary for each course. For example, in a geology course you might want to use something like C = class, I = igneous, T = time, V = volcano. In a writing or literature course you might use CS = character summary, P = plot, T = theme. In a psychology course you might use CS = case study. Don’t forget to use arrows or other symbols to save writing whole words. Notes don’t have to be super neat, but you do need to be able to read them. Messy but legible is okay. Don’t bother writing down things you already know. Take fewer notes. While seeming counter-productive, this actually makes the brain work harder as it sorts out the meaningful points and decides what information is worth writing down. Just make sure your notes aren’t too skimpy. You need to have enough written down to understand the subject. Simply listening to lecture videos several times is not as effective as actually writing down key points. Similarly, for note-taking while reading a book, write the words rather than highlighting key words or recording yourself summarising the text. Set aside a few minutes afterwards to read through your notes. If necessary, summarize or rearrange them so they make sense. 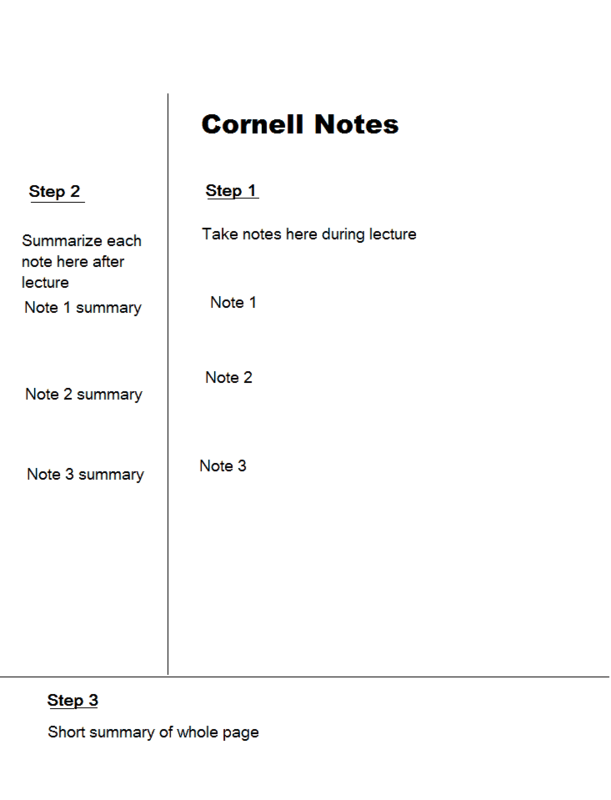 Some people use the Cornell notes technique described below. Use this time to really make sure you understand all the material. If you feel lost at this stage, you will need to revisit the lecture, textbook, or other resources, writing down key points again as you go. It may take several attempts before full understanding is reached. To prepare for exams, ask yourself questions until you can explain both the main points and lesser points from memory. Explaining it to someone else can be a useful way to see how much of the material you really retained. Try teaching it to a friend, a recording device, your dog, your mirror, or your bed! If you are in a public place and don’t want to talk to yourself, try quietly whispering or visualising all the words in your head. How would you explain this to a young child? This sort of reformulating or summarising is not only an excellent test of your knowledge, it’s also a great way to actually teach someone else. Take a sheet of lined paper and rule a noticeable line about 5 or 6 lines up from the bottom of the page. Below this will be your summary area which you will fill in last. Now rule a vertical line about 5 cm (2 inches) from the left side. On the left is your main points area. On the right is your note-taking area. Write brief notes in the large area as you listen to the lecture or read the text, leaving a line between each. Afterwards, write one or two relevant words per note in the left column. These are your main points. Now, summarize the whole thing into the space at the bottom of the page. Your notes are now ready for revision. To construct a mind map, turn a large piece of blank paper sideways to give yourself plenty of room to spread the ideas out. Write the main theme or topic in the centre of the page and draw a ring around it. Major points go inside rings around the central idea as they are mentioned, then the minor points are connected to each major point. While mind maps can be constructed as you listen to a lecture or read a book, they really come into their own when writing essays. Rather like mind mapping, but instead of the page turned sideways with ideas linked together, it’s more like a list of the main points, with minor points listed below each main point. You may have heard of SQ3R. Rather than a note-taking tool, this is a strategy to improve your reading comprehension. Although they are a study aid rather than a note-taking technique, flash cards can be helpful if there is a lot of learning needed. For instance, definitions of particular terms or symbols, explaining diagrams, or mathematical formulae. You write a question or similar on one side of the card and put the explanation on the other. Look at the question and try to remember the corresponding definition or explanation before flipping it over. Flash cards are an amazingly useful learning tool in many situations, and are portable as well. Flash cards can also be used for small diagrams with lines and arrows connecting themes, ideas, thought processes, or outcomes. 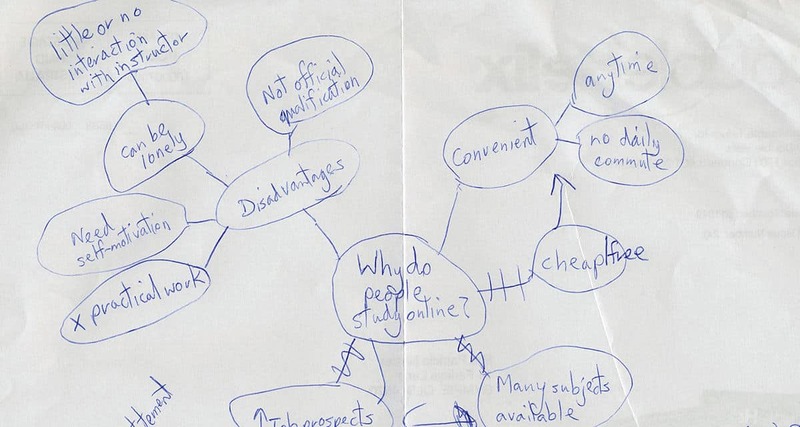 Don’t be afraid, though, to use a large piece of paper, turned sideways if necessary, to construct a complex diagram. Students can sign up to Cerego for free. You can create your own reference materials plus questions and answers to help you learn complex subjects. If you have dysgraphia, which is a specific learning disability that affects fine motor skills, including handwriting, a laptop might be the best way of taking notes for you. If taking notes this way, try to make short notes by engaging your brain. Search for the meaning behind the words rather than typing up every word the teacher says. My notebook is ready and waiting for my next course. After brushing up on how to take better notes, I plan to use the knowledge to improve my results. I have found that the lecturer’s slides are an excellent way to first preview a lecture and then to review post lecture. However, sometimes a MOOC lecturer does not make the slides available in a file. Stopping a lecture to snip and paste each slide into a Word document is very labor intensive and disruptive. A request to a recent MOOC to put all the slides in a single file was ignored. Is there anything Class Central can do to resolve this? Thanks for reprinting the article. Always useful to remember.